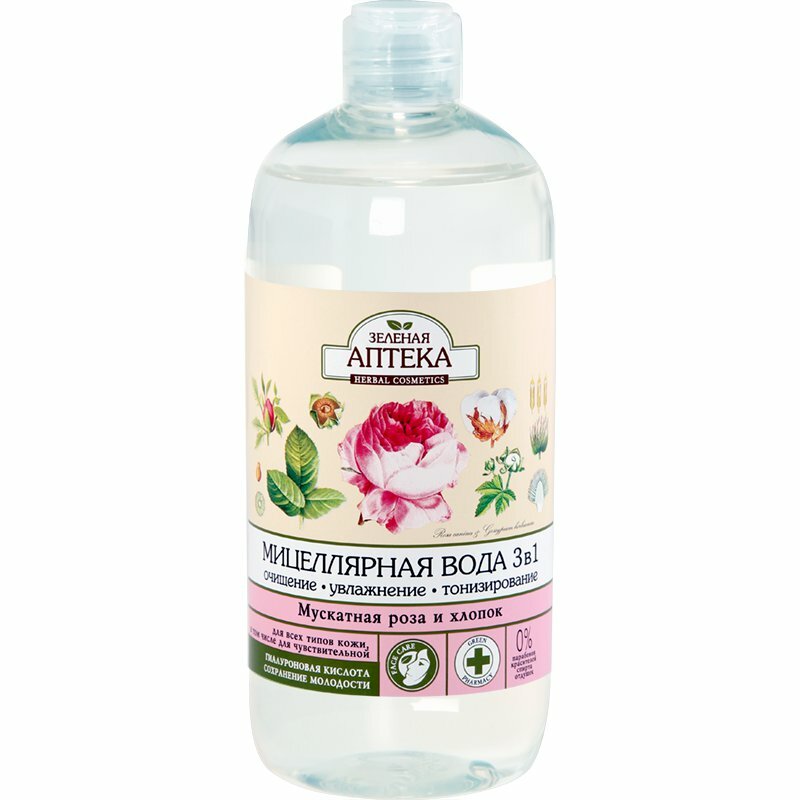 Muscat Rose and Cotton 3 in 1 Micellar Water is produced by the Ukrainian beauty brand Green Pharmacy. It is an effective skincare product that provides a 3 in 1 effect. It effectively removes dirt, grime and makeup residue; deeply moisturises the skin and prevents premature skin ageing; has a toning effect and improves complexion. The product is suitable for all skin types including sensitive skin. Enriched with hyaluronic acid. Effect. This micellar water by Green Pharmacy has a 3 in 1 effect. One: it cleanses your skin gently yet effectively thanks to micelles, special nano-sized particles that absorb sebum and help to remove dirt and makeup residue from your skin. Two: it hydrates the skin and helps to prevent premature skin ageing due to hyaluronic acid. Three: it has a toning effect on your skin and makes it softer due to rose hip extract and cotton seed extract. Active ingredients. Hyaluronic acid, cotton seed extract, rose hip extract, lactic acid. Free of parabens, colourants, alcohol, fragrances. Directions. Pour some micellar water onto a cotton pad and wipe the skin. Suitable for the skin of eyelids, face, lips, neck and décolletage. Can be used daily. Ingredients. Aqua, Sorbitol, PEG-40 Hydrogenated Castor Oil, Poloxamer 184, Panthenol, Sodium Hyaluronate, Gossypium Herbaceum Seed Extract, Rosa Canina Fruit Extract, Lactic Аcid, Dissodium EDTA, Propylene Glycol, Benzyl Alcohol, Sodium Benzoate, Potassium Sorbate. Want to buy Muscat Rose and Cotton 3 in 1 Micellar Water? Call us or submit your order via our web site!